"Astronomers using data from NASA's Hubble Space Telescope caught two clusters full of massive stars that may be in the early stages of merging. The 30 Doradus Nebula is 170,000 light-years from Earth. What at first was thought to be only one cluster in the core of the massive star-forming region 30 Doradus has been found to be a composite of two clusters that differ in age by about one million years. 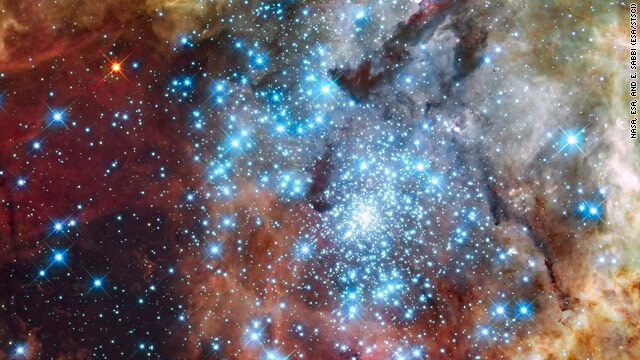 The entire 30 Doradus complex has been an active star-forming region for 25 million years, and it is currently unknown how much longer this region can continue creating new stars. Smaller systems that merge into larger ones could help to explain the origin of some of the largest known star clusters. The Hubble observations, made with the Wide Field Camera 3, were taken Oct. 20-27, 2009. The blue color is light from the hottest, most massive stars; the green from the glow of oxygen; and the red from fluorescing hydrogen."